Merle Wood & Associates will be showing no less than nine yachts at the upcoming Monaco Yacht Show and MYBA Selection either as sole central agents or as a joint central agency. 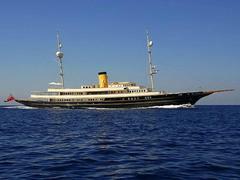 Firstly, there’s the 90m Nero, a joint CA with Burgess, followed by the 64.6m My Shanti built by Amels, Feadship’s 62m Fortunato, Benetti’s 55.7m Allegro and Hakvoort’s 50m Jemasa. Also on show and all joint agencies with Edmiston are Feadship’s 65m Trident, Abeking’s 57m Ultima III, Proteksan’s 53m Vinydrea and the 50m Shandor from Schweers.